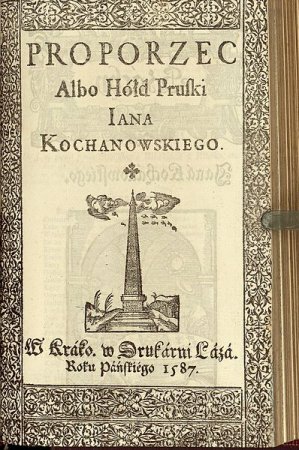 Feudal Homage Paid by the Prussian Duke Albert Frederick to King Zygmunt August on 19 July 1569 during a Sejm in Lublin. On 19 July 1569, the 15-year-old Duke of Prussia Albert Frederick, the son of the Duchy’s first ruler, Albert von Brandenburg-Ansbach, who had died in 1568, came to Lublin while the Sejm was in session to pay a feudal homage to King Zygmunt August. It was an act of formal confirmation of the vassalage of the Duchy of Prussia to the Polish Crown. As a symbol of vassalage, the King handed Albert a standard with the Prussian coat of arms. 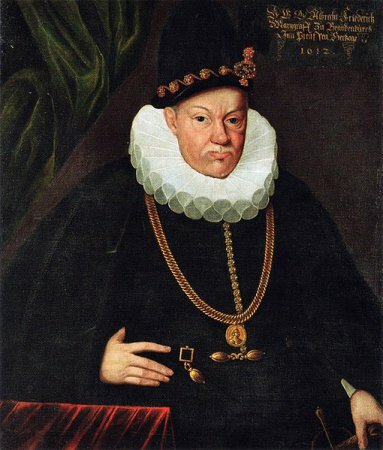 The King also allowed the attending envoys of the Elector of Brandenburg to touch the standard in what signified a formal confirmation of the 1563 royal pledge to transfer the Prussian feudal homage obligation to the Hohenzollerns dynasty, should Duke Albert Frederick have no firstborn male heir.